Our bike tours in Italy. Along small hilly roads lined with cypresses or in the alleys of its medieval villages, Italy will amaze you with its history, the art of living of its inhabitants and its magnificent landscapes. To discover all its charms, there’s nothing like cycling around Italy. 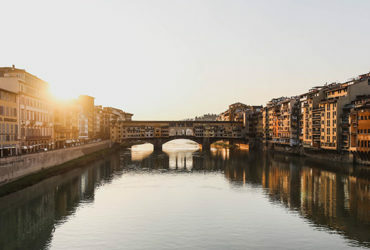 Along the greenways or on the roads of Tuscany, cradle of the Renaissance, Italy invites you to take the time to enjoy the beautiful and good things in life. The numerous wine routes will allow you to discover cities of art steeped in history. The local gastronomy will not fail to delight your taste buds and offer you gourmet stops throughout your stay. The warm welcome of the Italians is legendary! In the land of Leonardo da Vinci and Michelangelo, life is good. The captivating nature did not fail to inspire these famous painters but also offer the inhabitants the resources which make the fame of Italy and contributed to cultivate the art of living in the Italian way. The Mediterranean climate has certainly something to do with it as it configures the landscape and a part of the economy: fields of olive trees as far as the eye can see, citrus fruits, rice, sun-soaked vegetables … No wonder Italian gastronomy has been exported worldwide ! Italy is also a land steeped in history and a true open-air museum. Historical monuments each as surprising as the other jostle to surprise you and make you travel in time. From the Colosseum of Rome to the famous leaning tower of Pisa or through the Basilica of St. Mark in Venice, Italy will make you travel through history, from ancient times to the present day. In the land the car reigns, it’s better to get away from busy roads to ride a bike safely. It is therefore necessary to prepare your bike trip in Italy to take full advantage of cycle paths or roads with little traffic. The country is working on the development of two networks, EuroVelo and Bicitalia, to improve cycling in this country with such a strong tourist attraction. At the same time, accommodation is increasingly adapting to welcoming cyclists with different levels of service. If the north of Italy has a rougher and continental climate, most of the country is bathed in a Mediterranean climate, very hot and very dry in summer. It is better to leave in the spring or September to be able to travel by bike in good conditions.